Wyoming auto shipping carriers have a lot of ground to cover. The Cowboy State is the smallest in America with only 577,737 people according to the 2018 census. However, that sparse population is spread over the 10th largest land mass in the country. Chances are high that if you want to be left alone, there is no better place than Wyoming. It is also breathtakingly beautiful. Whenever a region, or in this case a state such as Wyoming, is so sparsely populated, it becomes very difficult to amalgamate full truckloads. A Wyoming auto shipping carrier needs 8-10 vehicles to make a 2,000 mile trip to anywhere. That take time in Wyoming. Even shorter car shipping distances of 1,000 miles requires 5-7 vehicles to make the journey, and that too is arduous. Wyoming has only two cities over 50,000 population, and both just barely. The largest is Cheyenne, the capitol, at roughly 64,000 people. The other being Casper at about 58,000 people. Laramie and Gillette are both approximately half of those figures. Other towns get smaller and smaller after that. So imagine you are shipping your car from Wyoming to New Jersey. How many other people in your community do you think are also doing that this week? Get the picture? You need eight or nine other vehicles in order for your car to get picked up and gone. If it happens within a week then count yourself lucky. Usually it takes longer. So you need in Wyoming a backup plan. Don’t leave home without it. You know what’s harder than car transporting from Wyoming? Shipping to Wyoming. It takes even longer and costs more. Your vehicle alone is not enough to get a Wyoming auto shipping carrier on the road. He will not make the trip until his trip expenses are covered (seven vehicles on average). And why do that if there’s no profit? The last two or three vehicles represent his profit and a good reason to get up in the morning. It takes time. Most of our negative reviews come from customers shipping to remote or sparsely populated areas and do not understand why it took so long? Our warnings fall on deaf ears. The situation is the same no matter the auto transport company you choose. One reason to choose Direct Express Auto Transport is that we tell the truth about auto shipping to Wyoming. Others may not. 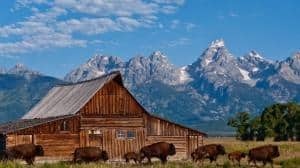 The northwestern area of Wyoming is dominated by two National Parks, Yellowstone and Grand Teton. Don’t try to ship from or to there. It almost never goes according to plan. If you do try it, expect to pay out the yaazoo. If car shipping from long distance, try to meet a Wyoming auto shipping carrier somewhere along the three major interstates that criss-cross the state. Meet a driver along I-90 in the north (Buffalo, Sheridan) ; I-25 in high plains eastern Wyoming (Cheyenne, Casper); or I-80 that cuts across the southern part (Cheyenne, Laramie). You want to make it as easy as possible for a carrier to fetch or deliver your vehicle.